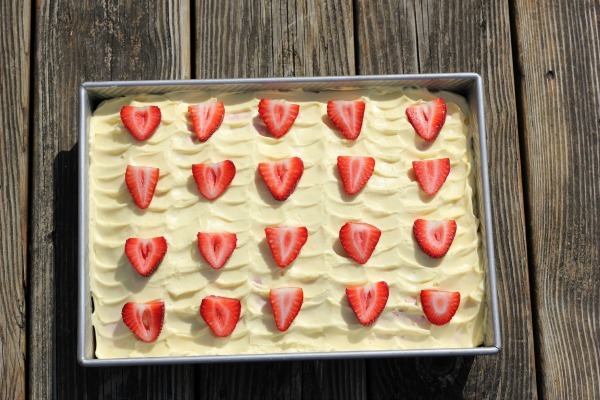 Strawberry Jell-O Poke Cake is a dessert my mom use to make when we were kids. My brother's and I loved it! It's such a light and refreshing cake and easy too since it's made from a boxed cake mix. Cake for our family get together. on a warm spring day! Heck, who am I kidding - it tastes good any day! The jell-o part is a little tricky when making cupcakes, but you can see how I did it here. 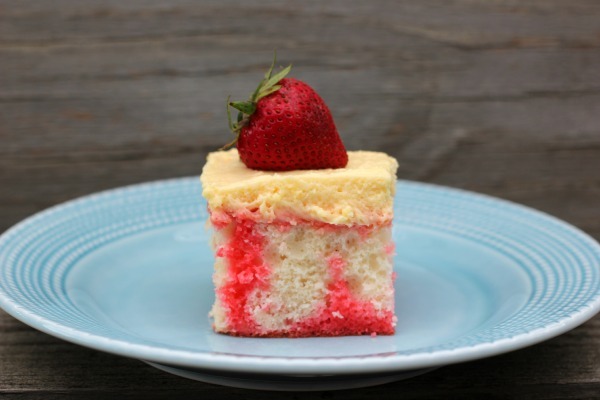 Anyway, if you've never tried Jell-O Poke Cake you should give this recipe a try sometime. I sent some leftovers home with my brother and took the rest to work the next day. Bake cake as directed on package. Cool cake on a wire rack for 15 minutes. Pierce holes in cake with a large fork or bamboo skewer at 1/2 inch intervals. In a small bowl, add boiling water to jell-o; stirring until completely dissolved (about 2 min). Stir in cold water and pour over cake. Refrigerate for 3 hours. Using a stand mixer whip all ingredients together to form stiff peaks. Garnish with fresh strawberry slices.